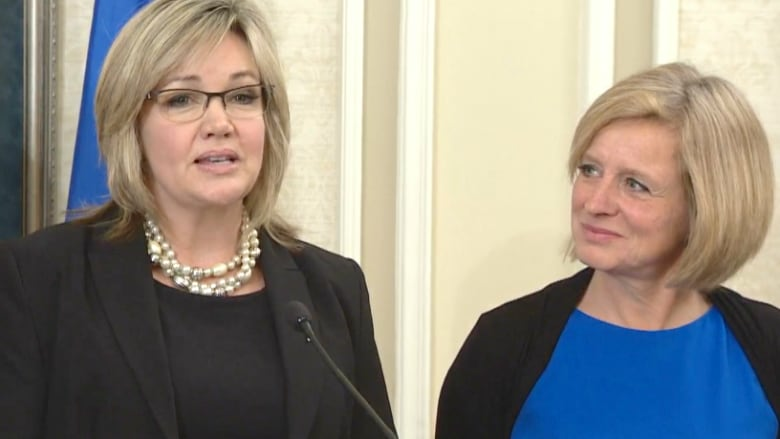 Alberta Infrastructure Minister Sandra Jansen intends to run for the NDP in her riding of Calgary-North West in next year's provincial election. The former Progressive Conservative, who crossed to the NDP nearly two years ago, wasn't available for an interview Tuesday but her press secretary confirmed Jansen plans to seek the nomination. Jansen was once a candidate in the leadership race for the Progressive Conservative Party. She left the race in November 2016, citing harassment and intimidation by another candidate's supporters. She crossed to the NDP nine days later. Premier Rachel Notley appointed Jansen to cabinet in October 2017. Jansen has been a frequent target on social media for supporters of the United Conservative Party, due to her vocal opposition to UCP Leader Jason Kenney and his history of socially conservative views on abortion and LGTBQ issues. The UCP has nominated Sonya Savage, senior director of policy and regulatory affairs with the Canadian Energy Pipeline Association, as its candidate in Calgary-North West. The party believes the environment and energy lawyer has a good chance to defeat Jansen, who was elected as a Progressive Conservative in the 2015 election. "It's really great knowing that we have a professional UCP candidate in Calgary-North West," party volunteer Sonia Kont tweeted recently in response to criticism from Jansen about the UCP's Pride breakfast in Calgary. "Jansen will be absolutely toast. She might as well run in Edmonton." Much of the focus this summer has been on the nominations for the United Conservative Party. The pace for the NDP has been much slower by design. Provincial secretary Roari Richardson said the nominations are rolling out in what he described as a "methodical, thoughtful way." "We didn't want a major rush to make sure that we were using these as a membership engagement tool, a fundraising tool, bringing people in, having moments to celebrate as people were nominated." Four members of the NDP's 54-member caucus have announced they will not run again: Transportation Minister Brian Mason, Calgary-Northern Hills MLA Jamie Kleinsteuber, Calgary-Acadia MLA Brandy Payne and Calgary-Varsity MLA Stephanie McLean. Eighteen NDP MLAs have yet to register as a nomination candidates with Elections Alberta. Nearly every member of Notley's cabinet is running for re-election, except for Mason. Speaker Bob Wanner's political future remains a mystery. His seat of Medicine Hat will not exist in the next provincial election. His spokesman said Wanner is considering whether he should run in Brooks-Medicine Hat, Cypress-Medicine Hat or not at all. The next provincial election is expected to be called in the spring of 2019. Vermilion-Lloydminster MLA Richard Starke sits as a PC in the Alberta legislature but can't run under that party's banner if he decides to seek re-election. That's because the PC party merged with the Wildrose to create the UCP last year. The party still exists on paper with Kenney as leader but will no longer be running candidates. Starke can remain a PC in the legislature because the rules allow members to identify with any party they choose. Starke chose not to join his former PC caucus colleagues in the new party because he didn't feel the UCP shared his progressive social values. He told CBC News on Tuesday that he is still deciding whether he will run next year. Four UCP MLAs have chosen not to seek re-election: Livingstone-McLeod MLA Pat Stier, Grande Prairie-Wapiti MLA Wayne Drysdale, Little Bow MLA David Schneider and Bonnyville-Cold Lake MLA Scott Cyr. Several UCP incumbents are facing contested nominations: Mark Smith in Drayton Valley on Aug. 29, Richard Gotfried in Calgary-Fish Creek on Sept. 7, David Hanson in Bonnyville-Cold Lake-St. Paul on Sept. 12 and Ron Orr in Lacombe-Ponoka on Sept. 21.